René Caldentey is a Professor of Operations Management. His primary research interests include stochastic modeling with applications to revenue and retail management, queueing theory, and finance. He has been published in numerous journals including Advances in Applied Probability, Econometrica, Management Science, Mathematics of Operations Research, M&SOM, Operations Research and Queueing Systems. 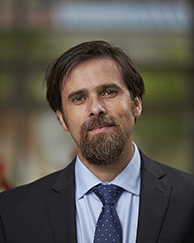 He has served on the editorial board of Management Science, M&SOM, Operations Research, Production and Operations Management and the Journal of Systems and Engineering (in Spanish). We consider a multi-class multi-server queueing system and study the problem of designing an optimal matching topology (or service compatibility structure) between customer classes and servers under a FCFS-ALIS service discipline. Specifically, we are interested in finding matching topologies that optimize --in a Pareto efficiency-- sense the trade-off between two competing objectives: (i) minimizing customers' waiting time delays and (ii) maximizing matching rewards generated by pairing customers and servers. Our analysis of the problem is divided in three main parts. fit the seller as they provide valuable information to better forecast demand. We investigate the optimal design of such a crowdvoting system and its implications on the seller's commercialization strategy.